Irish Girlie’s creativity continues to bloom and has resulted in some absolutely stunning designs that I can’t wait to get my knitting needles on. She asked me to help her with the photos that accompany the patterns and I jumped at the chance. Mother nature was not on our side and the Sunday morning we planned for the photos was cold with the first real rain of the season up here in Northern California. But I discovered a sweet corner in the cafe next to a huge window with amazing light. 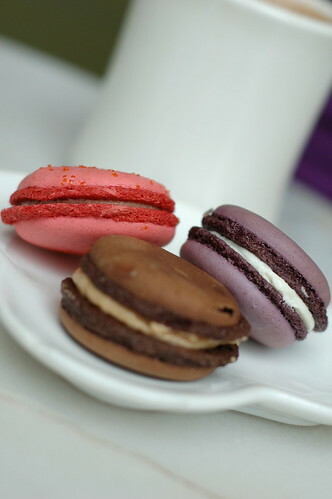 So we bought some macarons and coffee and hot chocolate and went to town. I had so much fun standing on chairs and moving this way and that. Thayer is such a fabulous model with great style. All of her poses were so gorgeous. 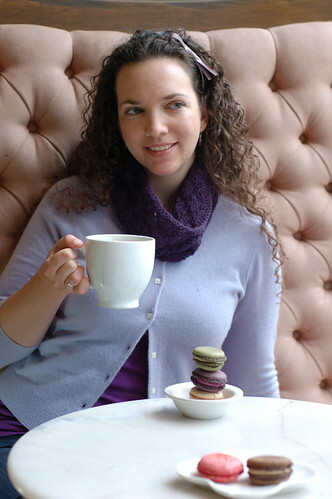 I loved the neutral cafe au lait background in the booth and the marble table helped reflect some light. After a good amount of time inside, the rain had stopped and we quickly moved outside for a few shots at the tables in front. It was also easier to get good images of Thayer standing and thus showing off the long circle scarf. Thayer brought a few sweaters to show off the various colors of the yarn. 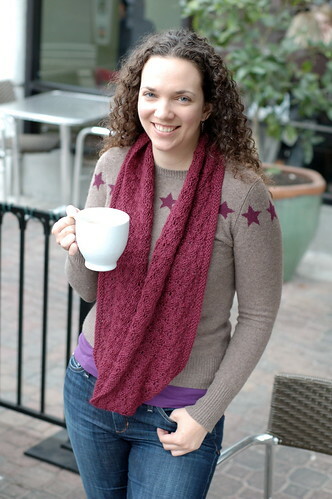 Isn’t that sweater with the stars perfect with the long scarf? Thanks ladies! You’re both so fabulous! Irish Girlie’s Blog and the specs on these new designs. Kollage Yarns – the yummy yarns used and pattern distributor. Thayer is a knitter and designer too. Plus She spins her own yarn and blogs about it. 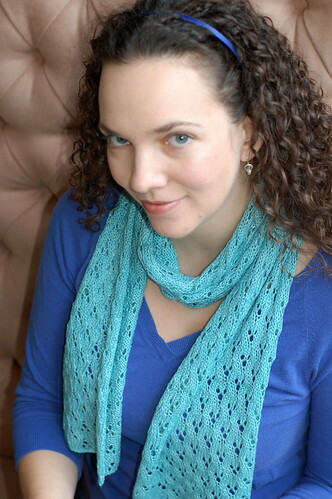 Erica aka kzooerica is the master mind and fabulous supporter of all of our knitting activities. Fabulous! You are so talented! 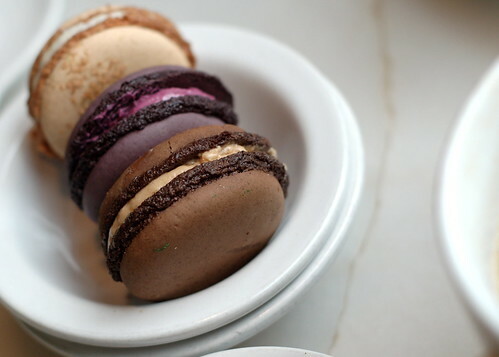 and the macaroons ain’t bad either!! You are a fabulous photographer Tricia and I so appreciate you and Thayer doing a great job! And yes, I think you like the climbing chairs and ledges part of your job the best. 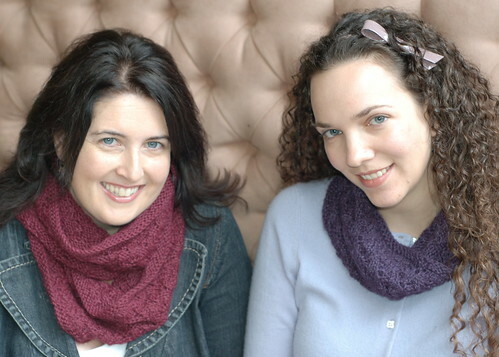 The patterns just about sold out at Stitches East so yours will be mailed to you! So exciting! 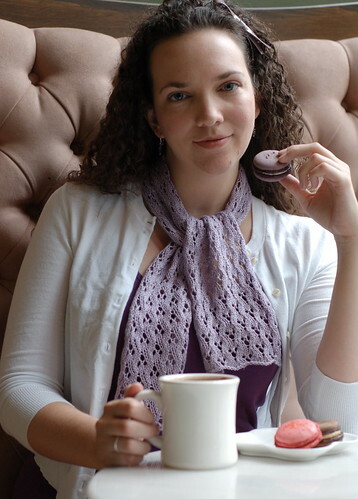 Great photos, great knits and great looking macarons! Such great talent. I love your photos.